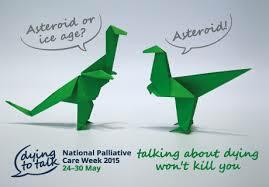 National Palliative Care Week runs from Sunday 24th – Saturday 30th May 2015. This year's theme is: Dying to talk; talking about dying won't kill you. Australians do not like to talk about death and dying, it is one of the last taboos. But death happens to us all and to have the best death possible, we need to plan and prepare for it. During National Palliative Care Week, Palliative Care Australia (PCA) is encouraging Australians to break the last taboo and talk about dying – it won’t kill you.